Hi, I’m Davide. Ride with me along the most adrenaline-packed trails of the Pinè Plateau and the Cembra Valley. Since I was a child, as soon as I had a free moment, I pedalled on my bike. From excursions of just a few miles to longer, more challenging ones, my passion grew alongside the distance covered. After being discharged from the Carabinieri, I returned to run the family hotel, now in its fifth generation. I started to plan off-road routes, become a qualified guide and accompany fatbike enthusiasts on the most adrenaline-packed and challenging paths in the Pinè Plateau and Cembra Valley. 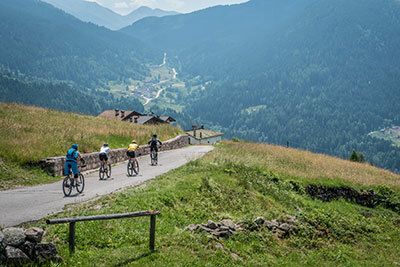 My favourite route is the Malga Stramaiolo: it’s a long one, demanding but above all extremely satisfying once you reach the top of Mount Costalta. Are you ready to ride with me? Hills planted with vineyards dotted with small villages, gentle slopes covered with woodland and expanses of meadows enriched by the presence of several lakes safe for bathing, such as Lake Lavarone, this is the very essence of our local area. 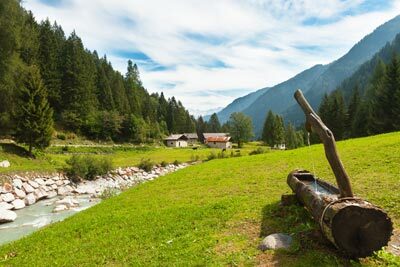 But also some of the most challenging individual trails in the Lagorai Dolomites, coastal trails and stretches for portage. From the shortest, easiest trails like the Tour of Ceramonte through to the longer, more demanding ones like the Regnana Valley - Mochèni Valley Tour, discover our recommended trails to ride at least once in your life. How can we make a mountain bike holiday absolutely perfect? Read on to discover our services designed for mountain bike lovers like us. 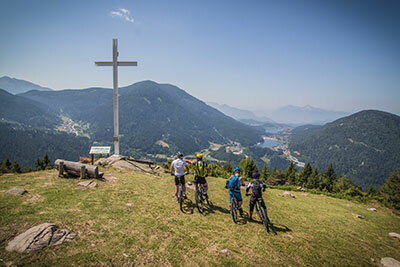 The local area, unique trails and passion are certainly key elements for your next mountain biking holiday, but these are not enough to make it truly memorable. Our experts will accompany you to discover the most adrenaline-packed routes and single trails and you won’t want to stop pedalling through the fantastic scenery of the Pinè Plateau and the Cembra Valley. 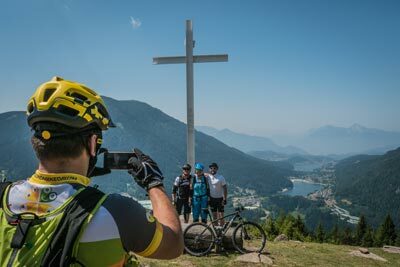 Discover all our offers to have that Mountain Bike holiday you’ve always dreamed of!